Blondie and Brownie: Oh, Canada! 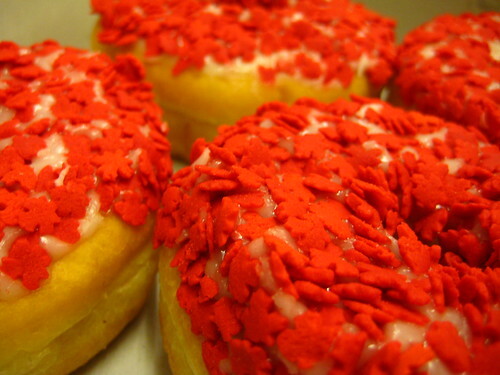 Oh, Canada Doughnuts!! Without revealing WAY too much personal information, I had secret knowledge of Tim Horton's Canada doughnuts, and many chances to stare at a poster of them for numerous days. "It's a sweet, nasty tease. Only available in Canada! I'll get you one day, you maple leaf dusted delicious objects of deliciousness!" Enter a co-worker having to make a one-day trip to Toronto for meetings. "Please, please, please, please, PLEEEEEAAASSEEEEEE bring me back some Canada doughnuts!! I'll do AAAAANYTHIIIING including cleaning up my work space! PROMISE!" Extensive bargaining occurred in the days up to this trip including an offer to borrow my mom's car to drive my co-worker to a Long Island home, in the middle of a school night. Finally, on the day of the trip, still unsure of whether I would be obtaining these Canadian goodies, one last email: "Gentle reminder: I love Canada. I love doughnuts. 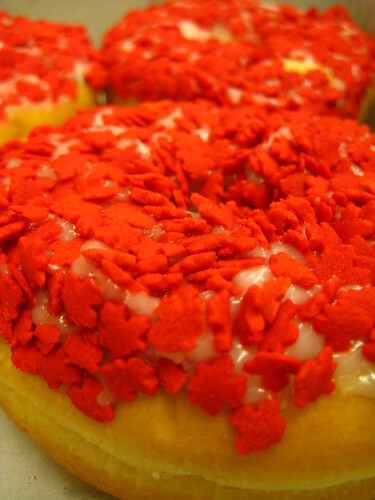 I love Canada doughnuts." And you can guess what was waiting for me on my desk the next morning. 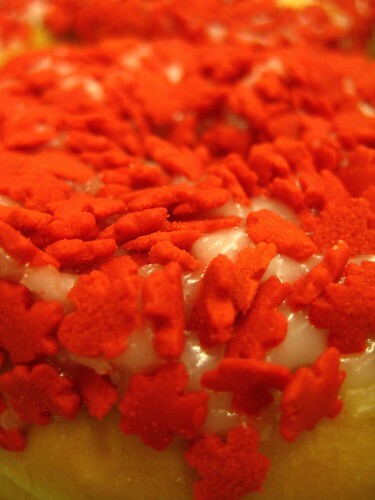 Four plain Tim Horton's doughnuts, smuggled across the unprotected border, coated in white icing, covered with little red maple leaves. "They were fresh when we got them," which leads me to believe that at least one was eaten in their home country. Best doughnuts ever? No. Being able to eat something off the American Tim HoHo's menu? Priceless. And I still haven't cleaned my work space. Oops. If you want to eat their American cousins, the Red, White, and Bloom, find your nearest Tim HoHo's location here. I am way more impressed by Canadian potato chips. Ketchup Lay's? Yes please!